Energy dynamics represent an important interface between an organism and its environment. A variety of factors, including body mass, locomotor strategy, and foraging behavior, determine an animal's energy demands. Body mass is the most important determinant in predicting metabolic costs both for resting metabolic rate (RMR; the amount of energy used by an inactive animal under thermoneutral conditions) (Kleiber, 1961) and total daily energy costs (TEE or FMR) (Nagy, 1987; Nagy et al., 1999). 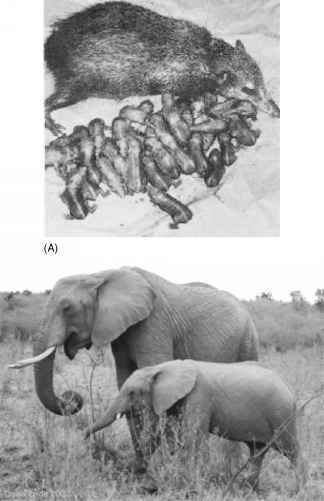 The Kleiber (1961) scaling relationship correlates RMR with adult body mass and demonstrates that RMR scales to the three-quarters power of body mass in mammals, from the very small (e.g., mice) to the very large (e.g., elephants). While most mammals have RMRs predicted by body size, certain groups (e.g., marsupials, edentates) deviate significantly from this relationship. scaling relationship. Although a number of explanations have been offered to explain hypometabolism1 in strepsirrhines, the phenomenon remains enigmatic. At least four hypotheses for strepsirrhine hypometabolism have been proposed: (1) adaptation to arboreal folivory, (2) adaptation to a diet deviant for body size, (3) a thermoregulatory adaptation, and (4) phylogenetic inertia (i.e., hypometabolism is a primitive mammalian trait) (Kurland and Pearson, 1986; Ross, 1992). Since Kurland and Pearson's (1986) review of strepsirrhine2 hypometabolism, RMR has been measured on numerous additional primate species, doubling the available data for strepsirrhines. Additional data are available on diet and ecology in primate species. In this chapter, we examine data on resting metabolic rates from a large sample of primate species to investigate variation in RMRs within the primate order. First, we explore the nature of metabolic variation in strepsirrhines and hap-lorhines, specifically focusing on strepsirrhine hypometabolism. We then consider whether specific ecological factors, such as folivory, arboreality, or activity cycle (i.e., diurnal or nocturnal), can explain strepsirrhine hypometabolism. After evaluating these proximate explanations, we then examine whether strepsirrhine hypometabolism may be a primitive characteristic shared with other closely related mammalian species. Finally, the implications of primate metabolic variation and strepsirrhine hypometabolism for early primate evolution are addressed.